My name is Dr. Kimberly Thomas Smith,D.D.S. I was born in Canton, Ohio (Home of the Football Hall of Fame) and moved to Morgantown,WV when I was 12 years old. I grew up in one of the best small towns ever. I grew up going to Mountaineer Football and Basketball games yearly with my Dad. I received my Bachelors of Arts in Biology(2000), my Masters in Safety and Environmental Management(2001), and my Doctorate in Dental Surgery(2006) all through West Virginia University. Upon graduating I practiced in New Hampshire. After relocating to Martinsburg, WV I continued practicing without interruption and was an associate at a private practice. 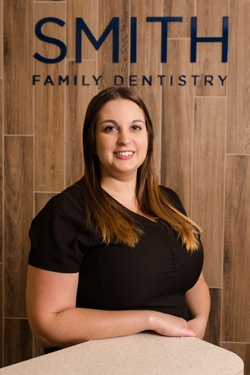 My experiences and desires have proudly led me to the formation of Smith Family Dentistry where I’m very excited to provide a valuable service to the community of Martinsburg where I currently reside. I am a member of the American Dental Association, The West Virginia Dental Society, and the Eastern Panhandle Society. I also am a member of The Academy of General Dentistry, the Better Business Bureau, and The Martinsburg Chamber of Commerce. 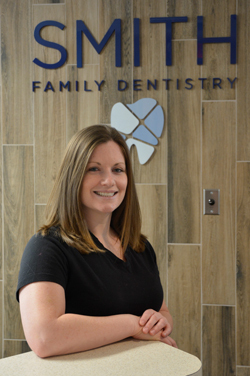 I have 2 younger sisters: Kristin, a Physician Assistant in Harper’s Ferry and Kerri, who will be following in her big sisters footsteps and becoming a Dentist with her specialty in Periodontics. In my spare time, I love to ski in Vermont with my family and also visit the beach in the summer. I enjoy the outdoors and exploring with my 2 little boys. My husband and I are very proud of our family including our two sons, Hudson and Clayton as well as Titan our French Bulldog. Opening my own dental practice has been a lifelong dream which has been supported by my father and mother. I was inspired at a very young age to pursue this career path by my grandfather who was also a dentist and my grandmother who was a dental hygienist. Hello I'm Robin. I am originally from Frederick, MD. I have been a dental assistant since 2007. I received my training and certification from Frederick Community College. I also attended Mt. Airy Medical College for my dental radiology certificate. I am a proud Mommy to 2 amazing and silly little boys. I have a loving support system of family and friends who have encouraged me to be the best I can possibly be. I am a member of the PTO at the school my kids attend and volunteer there often. In my spare time I enjoy baking, playing sports with my kids and being a team mom for my son’s baseball team. 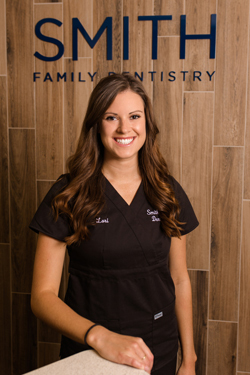 My name is Alyse and I am excited to be a part of the Smith Family Dentistry Team! I am a local girl so I am familiar with the area. I have been a Dental Assistant since 2008 and have worked with Dr. Smith previously. I attended Dental Assisting classes at Blue Ridge Community College and have received my Expanded Duties Dental Assistant Certification from the WV Board of Dentistry. I have a passion for perfection and enjoy when people smile. I believe that good dental hygiene makes people smile more and that a simple smile can make someone’s day brighter. When I am not at work I enjoy spending time with my family and two dogs, Toby and Jax. My name is Lori and I am a Dental Hygienist. Originally from the Spring Mills area, I moved to Virginia to attend Old Dominion University. After graduating with my Bachelor of Science degree in Dental Hygiene, I lived and worked in the Virginia Beach area for four years. I miss the beach, but I am excited to be back in my hometown. 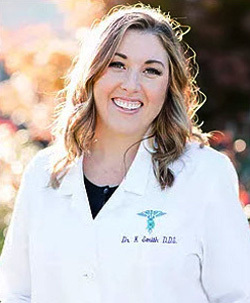 I am passionate about educating patients and enjoy when patients achieve their desired results. In my spare time I enjoy running, snowboarding, and spending time with my friends, family, and my dog Lola.